Durham Army Cadet, Sergeant Daniel Wilkie, proves that joining the Army Cadets and gaining qualifications can help to turn your life around. Daniel spent most of his childhood in care after a tragic event when, at just three years old, he witnessed the death of his father in the street where they lived. He joined Ryhope Detachment of the Army Cadet Force in Sunderland in May 2010 at the recommendation of his probation officer who warned him he was facing a future potentially filled with problems. This was the start of a life-changing time for Daniel who also spent almost four years taking care of his grandmother, who suffered from dementia, until she passed away in 2012. 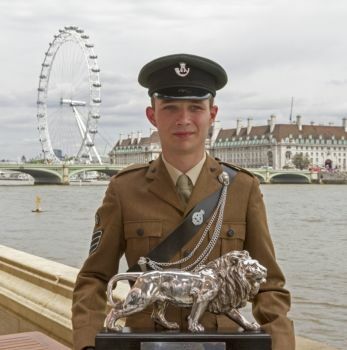 Thanks to his BTEC studies through the Army Cadet Force and CVQO, Daniel was nominated for the CVQO Duke of Westminster Award 2014 and was crowned the eventual winner for his contribution to the community, voluntary work with various charities and his outstanding commitment in first aid. He is now seen as a local hero, inspiring others with his hard work and dedication, and has also been awarded the St John Ambulance First Aider of the Year Certificate and presented with a Royal Humane Society Certificate by the Lord Lieutenant of Tyne and Wear. On learning of his win, Daniel said: “I’m very proud and very shocked – I’m not sure what made me stand out from the others as they all deserved to be here. I will remember this day for a long time."